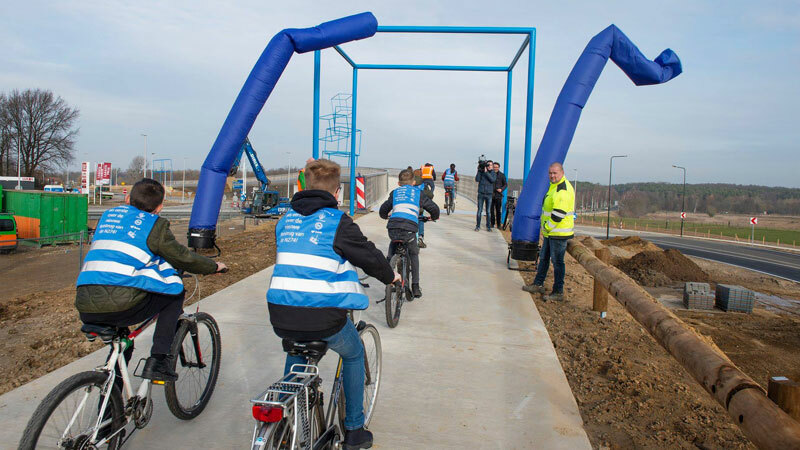 School children opened the new cycle bridge near Schinveld in the province of Limburg, by cycling across it together with the provincial representative for mobility on 20 February last. 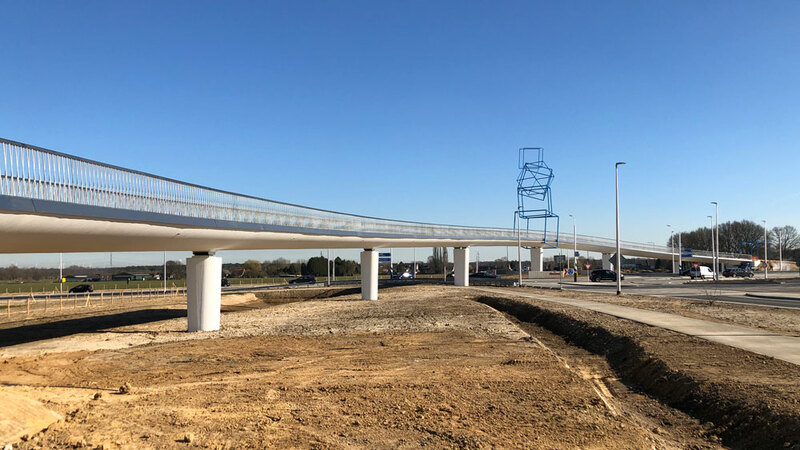 The long bridge over the redesigned road from Heerlen to Roermond (via Germany) offers a shorter route – for most people – than the former cycleways did before the road was expanded. This new bridge demonstrates nicely that even in the most remote corners of the country the Dutch build excellent cycling infrastructure. 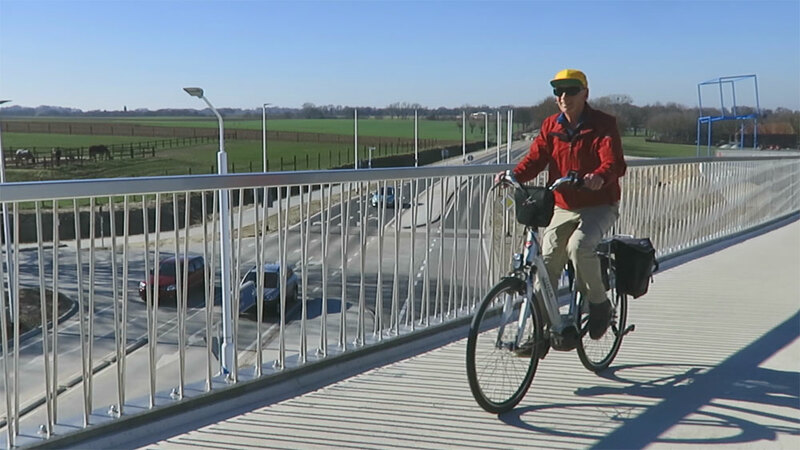 This older gentleman on his bicycle clearly enjoys cycling on the new cycle bridge near Schinveld. Just one week after the festive opening I went to visit and film the new bridge (actually a viaduct). The 27th of February was a very clear day with weather that would be normal on a day in Summer but not in February. The bright blue sky made the new white concrete of the bridge even more spectacular. The only thing missing was the deep green of the grass. Just one week after the opening most of the surroundings of the bridge were still only exposed dirt. That it was also 20 degrees meant that everybody who had the opportunity to make a cycle tour did just that on this Wednesday. I had arrived at the bridge on an OV-Fiets (rental bike) from the station of Sittard, just 10 kilometres to the west. The shortest route between these two points is via Germany, so I crossed the international border 4 times that day (and I didn’t even bring my passport). My cycle route from Sittard to Schinveld led me through Germany. Near Schinveld (since 1 January 2019 in the municipality of Beekdaelen, called Onderbanken before that date) the N274 provincial road had two roundabouts. This area is the north-west corner of a region called Parkstad Limburg. A conurbation of 8 municipalities who work together to improve public services, transport and housing on a regional level. 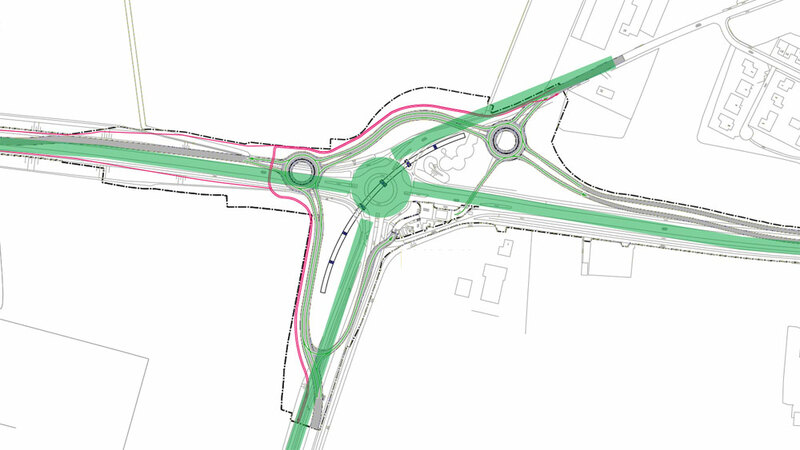 The roads leading to the two roundabouts were straightened out to improve the traffic flow in this developing region and the two roundabouts were replaced by one larger turbo-roundabout. The Dutch manuals and the Sustainable Safety policies advise to have grade-separated crossings for cycling and walking near a turbo-roundabout, especially outside the built-up area such as here. The curvy route around the two roundabouts in the before situation was replaced by one long much straighter bridge that actually makes the route shorter for most people. 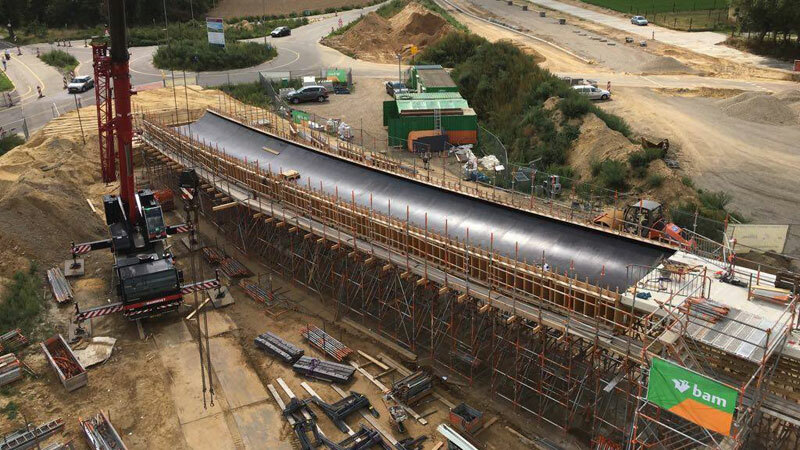 The mould for the bridge deck is clearly visible on this picture from the Facebook Group N274 Onderbanken. 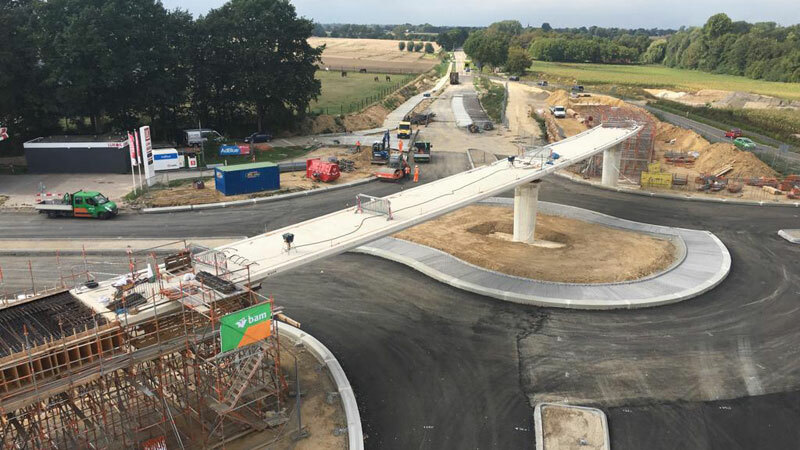 The turbo-roundabout under construction with the partly finished bridge deck of the new cyclebridge over it. Picture from the Facebook Group N274 Onderbanken. The province asked a visual artist based in Amsterdam, Marijke de Goey, to design the bridge and she did that together with engineers from IPV Delft. That firm is a household name on my blog. They design so much cycling infrastructure that I showed you several of their bridges already. Both De Goey and IPV Delft now report they designed a simple and effective bridge with clear lines and an integrated work of art. It is interesting that the bridge clearly feels like an IPV bridge while the artwork clearly bears the signature of the artist. The 330 metre long bridge was estimated to cost 2 million euros. The concrete part is almost 190 metres long. The long embankments on either side of the bridge create an easy access to it. The east access ramp is a bit shorter and therefore steeper, but not so steep that you couldn’t conquer the slope in a comfortable way on an ordinary Dutch upright bicycle. The bright white in-situ concrete was – as that name implies – poured at this location into moulds, which makes the bridge seamless and slick. The spans between the slender pillars are 28 metres. These openings are wide enough to give a clear view of the surrounding rural environment. The long horizontal line of the bridge is emphasised by the railings. They have no balusters or horizontal bars that would interrupt this view. Instead, the railing is shaped like a lattice girder with fine stainless steel bars that will stay clean and shiny. The lighting is also unobtrusive because it is integrated in the railing. From under the handrail LED lights illuminate the bridge at night. Schoolchildren opened the bridge with the Province representative for mobility on 20 February 2019. Picture from the Facebook Group N274 Onderbanken. One week after the opening the surrounding landscape was still very barren. The grass needs to regrow here. I expect this to be green again before the Summer. The central part of the artwork, the blue stacked cubes, is clearly visible. The only outstanding objects on this bridge are the three large pieces of the artwork. The sculptures, consisting of bright blue cubes in different configurations, are called “the lotus flower”. According to the artist herself, the bridge is meant to welcome you while the sculptures give a dynamically changing visual image. That is because they look different from every position due their shape. Many people paused right under the central sculpture (directly over the new turbo-roundabout) to enjoy the new view from the bridge. When they looked north they could see the German border at the horizon just 500 metres away. The restored international border with Germany just 500 metres north of the new cycle bridge. Since this road was constructed as a Dutch road, which it remained until 2002, the cycleways simply continue on the German side of the border. It is interesting that the provincial road N274 was once constructed like this: for 6.7km through a part of Germany. It continues at the other side of the German salient. This part of Germany (which is also the most western point of the country) really pierces into the Netherlands. The German municipality of Selfkant has a 27 km long border with the Netherlands (south, west and north) while it only has a 6 km long border with the rest of Germany in the east. In the early 1960s, when the road was built, this municipality officially belonged to the Netherlands. The Dutch state had been allowed to annex this part of Germany as part war reparations after the London Six-Power Conference in 1949. Even after the territory was bought back from the Netherlands by the Federal Republic of Germany for 280 million Deutschmark in 1963, one strip of land remained Dutch, with only that road on it. The road didn’t have a single connection to Germany; all the crossing roads were grade-separated, because you were not allowed to enter Germany from that road. To prevent that, it was even illegal to stop! After the Schengen Agreement, that allows free movement across the internal EU borders, this strange anomaly could be abolished. In 2002, the road became the German L410 which was soon connected to the crossing local roads. As a Dutch road it had been constructed with one-directional cycleways on either side and they are still there to this day. That is the reason that this road is exactly the same on either side of the restored international border. 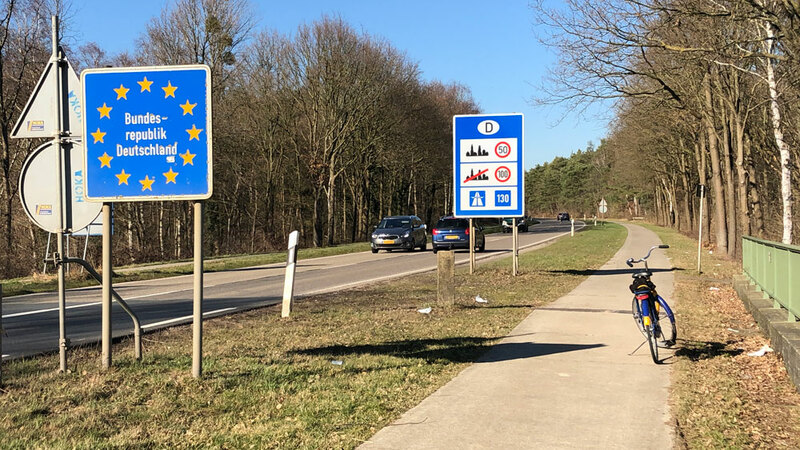 Most of the time the cycling provisions change dramatically when you cross the Dutch-German border. 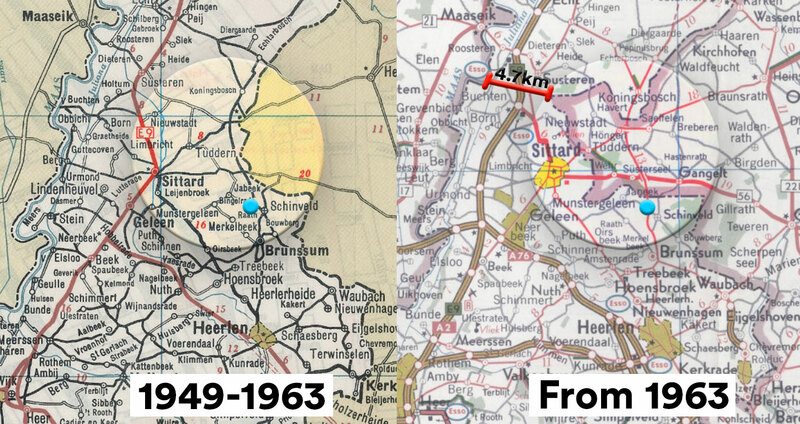 The border between Germany and The Netherlands was clearly different from 1949 to 1963, after the Netherlands had annexed the municipality of Selfkant as part of war reparations. In 1963 the border from 1815 was restored. This means that the most western point of Germany is surrounded by The Netherlands on three sides. It also makes The Netherlands just 4.7 km wide at that point, because that is the distance from that East border to the river Meuse, the West border with Belgium. The blue dot marks the location of the new cycle bridge. My video this week is a report of the new cycle bridge near Schinveld. I filmed the ride across the new bridge in 360 degrees. This cycle bridge (which to my knowledge has no name) is a good piece of cycling infrastructure that was built where it was necessary: to safely cross a major road. The Dutch keep updating dangerous crossings like this one, so cycling, also in the countryside, is a good alternative to the private car. After seeing this post IPV Delft proudly sent me some extra pictures of this bridge with permission to share them here. I like the 360 video. I was able to stop right below the centre sculpture and look up into it. Neato! Is that some kind of trolling from the Dutch local authorities ? Otherwise great news, but I wonder why they didn’t built extra ramps to connect the “german” paths…kind of a huge caveat for an otherwise great project ! This is no trolling, but wise spending of tax payers money. The major car infrastructure does not always follow the same path as the main cycle routes. 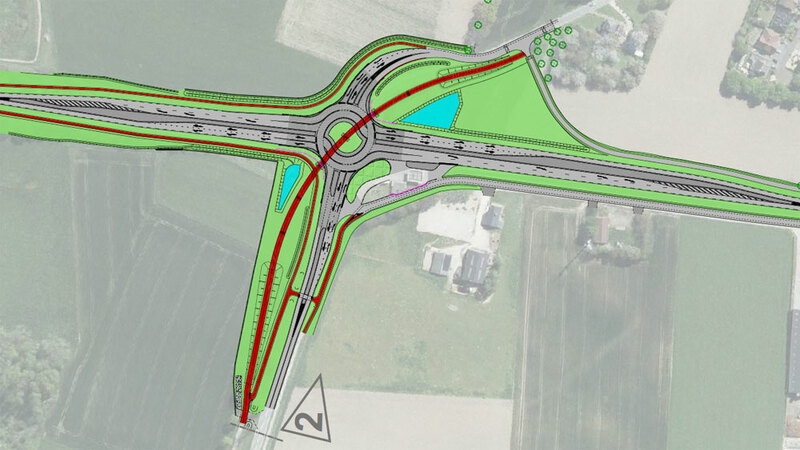 People from Sittard are more likely to go via Wehr-Jabeek-Etzenrade and follow the new bridge’s trajectory. People from Gangelt go via Mindergangelt-Eindstraat or airport, and these ways do connect to the border cycle path. The N274 is connected to the German major car-grid, but slower traffic still passes underneath or over it. Then again, the local Germans don’t cycle that much. The few mandatory cycle paths in Gangelt are on shared foot paths and often in poor condition. The long-distance cyclists won´t use the bridge at all. They simply cross the street at the 2 cubes, and pass behind the gasstation towards Brunssum. The world should be constructing bicycling ways like this to connect the whole world! The cost savings of healthcare, energy consumption, pollution )air and noise) and increased productivity would pay for it many times over. 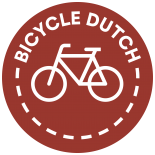 This entry was posted on 20 March 2019 by Bicycle Dutch in Original posts and tagged 360-ride, big bridge, exceptional cycling infrastructure, Germany.